How Not to Get Hit has a friend in China who arranges Kung Fu experiences for people looking for a life-changing adventure, from one month to one year. Zhou Zhen Dong is the head of the Yantai branch of Taiji Mantis. 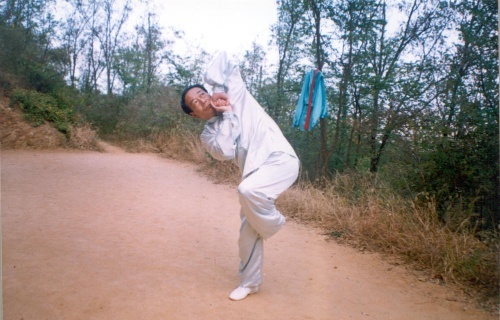 The sole inheritor to his teacher, Zhang Kai Tang, he teaches Taiji Mantis as well as Hao family Meihua Mantis. Highly respected both in China and the west, he has taught students from many countries, including UK, USA, Austria, Hungary, Russia and Japan as well as various parts of China. My first teacher was called Yu Zhi Ru. I was around 15 when I started training with him. Master Yu was a Chinese doctor. He would read people’s pulse and prescribe them herbs for a small fee. He did this secretly. He was very skilled, you didn’t need to tell him what illness you had, he could tell by your pulse. Actually I met him because he was a friend of my grandfather. When I was a child he often came to our home, and sometimes he talked about kung fu, showing us some moves. I was interested, and started learning “sheng yuan men” (saintly ape style) from him. The forms included “bai yuan chu dong” (white ape exits the cave), “bai yuan kui yuan” (white ape spies the orchard), “bai yuan tou tao” (white ape steals a peach), “bai yuan gun” (white ape staff), “bai yuan xian tao” (white ape offers the peach), “bei dou quan” (fist of the north star). These are derived from a Chinese myth. There was a white ape. His father died and then his mother got ill from depression. White ape heard there was an orchard on a mountain where the peaches of immortality grew every 500 years. He decided to get his mother a peach. So after leaving his cave he set off on a long journey. When he finally arrived on the slopes of the sacred mountain, he found the orchard, first spying it from afar to see if it was guarded. Seeing the coast was clear he ran right in and stole a peach. However he was caught by Er Lang and the two of them had a staff fight. Bai Yuan begged him to stop attacking. Once Er Lang realised Bai Yuan could talk he asked why he stole the peach. Moved by the story of his mother, he agreed to give him one peach. Bai Yuan returned home and gave the peach to his mother. Surely, his mother was cured, and so they bowed down and paid respects to the god of the north star. Master Yu had a huge black cat which he really loved. That time China was really poor and people were hungry. One day the cat stole some neighbours dried fish, and they caught it and killed it. My teacher became really depressed and got sick. At that time, Master Yu was over 80 years old, and his wife was 30 years younger than him. He was retired at home, and she was still working. Everyday after school I helped to look after my teacher. He told me to go out and buy ginger, leek and radish, and then cook it and put it in a cloth. He then put the cloth on his body to sweat out the sickness. After doing that for a while he started to get better. But then after a year or two, he got sick again, this time more serious. He stopped teaching me kung fu as he got weaker, and taught me pulse reading and Chinese medicine, making me read a lot of old books I didn’t really understand. His wife and I looked after him until he passed away at 85. Me and his wife carried his body to be cremated. Zhang Kai Tang was my neighbour. My sister was engaged to his son and she introduced me. Master Zhang asked me to show him what I learnt, so I performed “bai yuan tou tao”. I used all my power. That time, everybody said I was really good. But he wasnt impressed at all. He said I was just using my arms, and had no body power. He offered to teach me the form “beng bu”. Before, I never imagined kung fu could be so difficult! Also, at that time, I didn’t understand much, what was Taiji Mantis, what was Meihua Mantis. Slowly Master Zhang explained. Bengbu is Taiji Mantis, which comes from Cui Shou Shan. He didn’t plan on teaching me anything more. But I kept hanging around, determined to learn more. So he asked me what do I want to learn, Meihua Lu or Chuan Zhi? He showed me a few moves. I thought Chuan Zhi looked nice, so I said Chuan Zhi. He explained Chuan Zhi was Meihua Mantis, from the Hao family. Chuan Zhi was 4 forms, 20 roads in total. Zhang Kai Tang studied with Hao Heng Xin for six years. 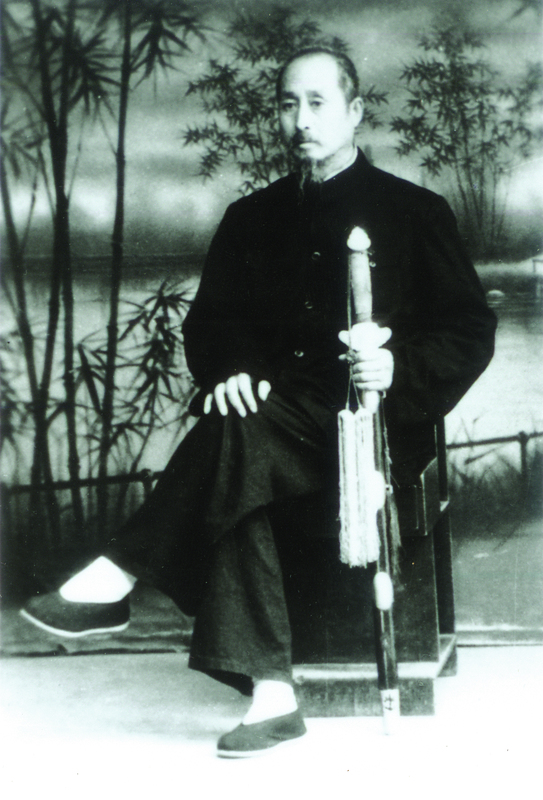 Hao Heng Xin was one of six brothers who were the masters of the Hao family Meihua Mantis. After that, his uncle invited Cui Shou Shan to be his live in teacher for another 6 years. That time was very strict, a private teacher who ate and slept with them. In the morning, they did iron body training, trained kung fu all day, then at 11pm every night did meditation. Zhang Kai Tang had 2 brothers, but they couldn’t take the harsh training and dropped out. 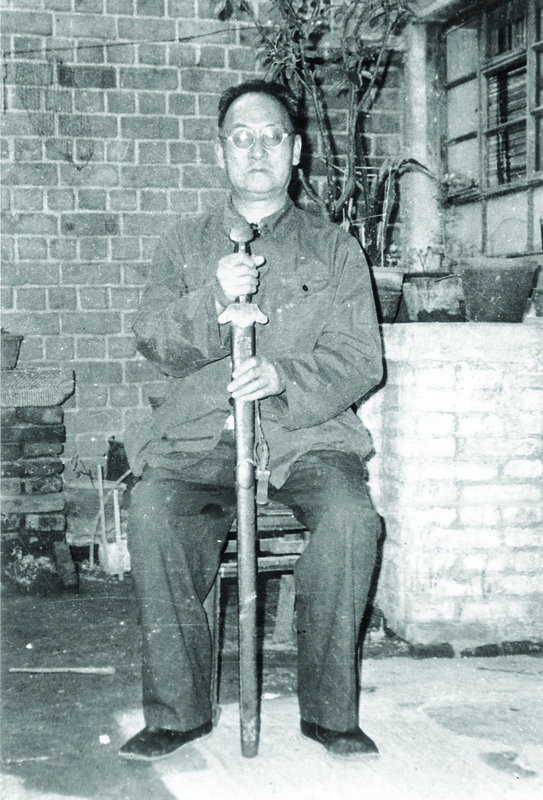 Hao Heng Xin was famous for his iron palm. It was said he could strike a match on his hand. Zhang Kai Tang learnt this skill from him. One time, during sparring, he hit his partner in the face. It made a cut on his eye which made his whole face swollen. This was due to the medicine they soaked their hands in before and after iron palm training. Hao Heng Xin had a student called Su Shi Chang. He was really strong, as he pulled the rickshaws for a living. He was out fighting one day and beat his opponent. He came back really happy to brag to his master. Hao Heng Xin was meditating, and got annoyed by his disturbance. Master Hao slipped his shoes half on and stood up with his eyes closed, offering to show the student some real skill. His left hand behind his back he held out his right hand softly and told the student to attack him. As soon as the student moved in, Master Hao palmed him in the face, cutting his eye. The next day it was swollen so bad he couldn’t even open it. After 6 years, Master Cui left at the invitation of Sun Xiang Ting to teach in a school there. Hao Heng Lu (elder brother of Hao Heng Xin) approached him saying “your boxing is great, really great, but you still haven’t mastered all the weapons yet.” He then asked my teacher to teach Master Cui’s style in his school and taught him Damo Jian (bodhidharma sword), Baxian Jian (eight immortals sword), Qixing Jian (seven star sword) and Meihua Qiang (plum blossom spear) in return. Master Cui was really angry by this and forbid my teacher to continue doing this. During the Cultural Revolution, traditional martial arts were classed under the “four olds”. Any kind of old culture or antiques were forbidden and destroyed. All you were allowed to do was study “Mao Ze Dong thought”, sing “socialism is great” etc. As far as traditional arts, they were replaced with modern wushu. “first level fist” “second level fist” “first level sabre” “second level sabre” etc. national regulated forms. This included the 24 posture form of taiji. You had to learn all the different Mao Ze Dong books and quotes, life were really boring. There was nothing you could do to enjoy yourself, no happiness. On top of that, life was harsh. Everything was planned and provided by the state. How much meat and grain you could eat every day was regulated. So if you were engaged in traditional activities, people would condemn you, persecute you. So that time we had to train in secret. In my teacher’s home, or at night after dinner, I would find a dark place with no people to train. I was seen by people from time to time, if people saw me, they would leave immediately, didn’t dare to get involved. Actually, not many people really went outside at night, they were so poor, so after eating, normally they just slept. And there was no lighting outside anyway. During the Cultural Revolution, the red guards just came into everyone’s homes, and took away anything old. Nobody could say or do anything, they took what they wanted and left. If you refused, they put a hat on your head and beat you in public. Called you a “right winger”, “bad element”, “counter revolutionary” etc. After Deng Xiao Ping came to power, these words were banned from use, and the hats were all burnt. He said we are all equal, nobody can persecute anyone else. When the Japanese invaded China they banned martial arts training, calling it “iron man training”. That time my teacher buried his weapons and iron palm urn under the ground. After several years, the Japanese were defeated, he dug them up. But they were all rusted. The iron palm urn was totally wrecked, but he restored the weapons. He taught his oldest son with his sabre, and they would cut bricks with it. Then during the Cultural Revolution, this sabre was taken away again. 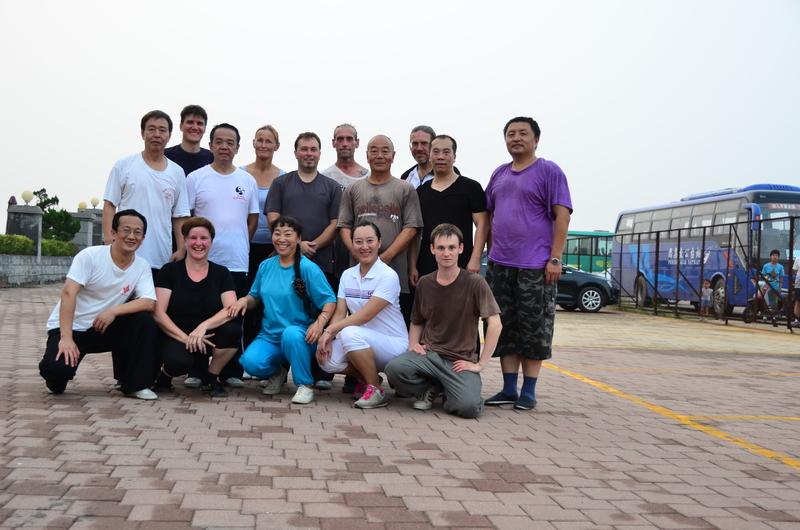 Nowadays, a lot of westerners like kung fu. In the beginning, westerners didn’t know what kung fu really is, and went to universities, or other places like shaolin temple, to learn kung fu. Cartwheels, flying kicks, actually that’s the same as gymnastics. Real kung fu is “among the people”. Slowly, westerners started to realise this, and are now looking among the people, rather than learning “flowery fists and embroidered kicks”, in the old days it was called “chou gong fu” “jun bashi”. Running around the hall leaping around, that isn’t martial arts, it’s gymastics or “yishu”. So after Deng Xiao Ping made the “open door policy” China realised the treasure of traditional culture and is trying to revive it. Tanglang quan has been included in the list of “intangeible cultural heritage”. Nowadays due to higher living standards and especially the “one child policy”, Chinese people are afraid of “eating bitter”. This means to endure hardship. This is especially the case in the cities. If you look in the big kung fu schools, the kids are all from poor rural areas. City kids will learn piano, English, dance etc. a lot of old masters have nobody to teach, their arts die with them. A lot of westerners come to China, train hard, respect and love the art; of course a teacher will want to pass their art onto them. Before, a lot of old masters were persecuted, killed, we learnt in secret, we couldn’t open a school or openly teach people. Anyway, a lot of old styles are being lost. In fact, I believe, in 20-30 years, if Chinese want to revive our arts; we will have to go to the west to learn kung fu. Kids aren’t interested, parents don’t want their kids to learn.